The Co-Lab Research group at TU Delft is constantly looking for people interested in doing a PhD with us on collaborative housing. Europe is witnessing the re-emergence of “collaborative housing”, i.e. a wide variety of self-organised and self-managed collective housing projects. These include co-housing, Community Land Trusts (CLTs) and residents’ housing co-operatives, amongst others. Typically, these housing forms feature relatively high levels of user involvement in the conception, planning, design, construction and management of housing for their own residential use. They are also characterized by the establishment of reciprocal relationships, mutual help and solidarity amongst residents, as well as by new forms of non-speculative financing mechanisms. Sometimes these projects are targeted to specific socio-demographic groups (e.g. the elderly, women, etc.) and often they have high environmental standards. While in some European countries collaborative housing is part of long-standing traditions of cooperation and mutual help (e.g. Germany, Sweden, Denmark), in others they were rather marginal until recently (e.g. France, Belgium, Spain, etc.). To realise their housing project, residents’ groups need to partner with a wide range of stakeholders, both individual and institutional, to access knowledge and resources. Professional housing providers in different parts of Europe are beginning to work with these residents’ groups for a variety of reasons, including improving the efficiency of their operations, empowering residents and local communities, and/or the wish to refresh their approaches through working and learning from grassroots actors. Responding to these new challenges requires a series of changes: on the one hand, housing professionals need to adapt the way they think and act to engage effectively and constructively with the different types of knowledge and competences of residents. On the other hand, their organisations need to transform accordingly. These developments call for empirical evidence on these developments in different European countries. -Organisational changes (what does collaboration mean for the housing associations involved?). Interested to do a PhD with us in this field? Get in touch with us to discuss the possibilities! Sara Brysch is an architect who worked in Porto, Berlin and Mexico City, where she mainly focused on architectural design, management and construction supervision. Her research interests include affordable minimum housing solutions; “Existenzminimum”; collaborative processes in housing; and participatory design. Providing affordable housing has been a recurrent challenge since the late nineteenth century. After the World War I, a concept called ‘Existenzminimum’ was applied to social housing programs in Europe, to set a living quality standard at affordable levels to the low-income classes. Its design approach aimed at maximizing both quality and functionality of the domestic layout, while minimizing its dimensions. Europe is currently facing an acute affordable housing crisis, which may justify the re-emergence of ‘alternative’ forms of housing management, such as collaborative housing (e.g., co-housing, new residents’ cooperatives, resident-led housing). Due to its collaborative approach towards design, recent evidences show that these models re-evaluate the minimum quality standards in housing, leading to new forms of affordable housing. The challenge of this project is to investigate which design principles could be used in collaborative housing to increase affordability, and the extent to which they actually contribute to affordability. Valentina Cortés is a Chilean Architect and MSc in Geographic Analysis from Universidad de Concepción, Chile. Her professional background involves experience in academia and practices on urban growth studies, geographic, urban and housing analysis, where she mainly focused on urban planning regulations, transport and dwelling policies. Valentina is currently a full-time PhD researcher on Collaborative Housing, under the supervision of Prof Vincent Gruis and Dr Darinka Czischke. 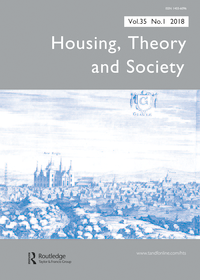 Her research focuses on the conditions for the development of “Collaborative housing in Chile” on the basis of a longitudinal analysis of urban policies and local planning regulations for housing and neighbourhoods in Europe and Chile since 1980.